This is an outdated patch. You should download a new patch. Please check Release Note on the side bar. There may be errors in the game and the game might crash if you encounter those errors. So, save your game often. If you want to name your character in English, you can use ABC/123 button, or you can use the Japanese sounds (like a, i, u, e, o, ka, ki, ku, ke, ko, etc.) from KANA button. (You need to push ALT button to alternate character sets.) This will be your name that is shown on screen. The last name and first name are limited to 3 characters (3 sounds) each. Only A-Z and a-z and the sounds shown in the pictures below are available as English input. SI = Shi, TI = Chi, TU=Tsu, ZI = Ji, etc. 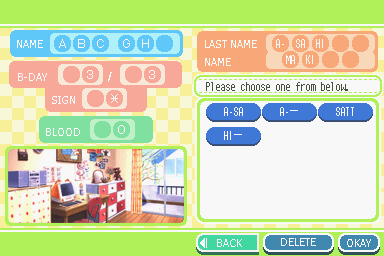 Now at the name pronunciation screen, you can choose how to pronounce your last name and first name by Japanese sounds. The game can only pronounce some common names. (Like Tanaka, Maki, etc. If you put names that the game can't pronounce, you will have choices of sounds to choose from.) This will be the audio when the (male) characters call your name. Most names in the ending credits. There may still be many mistakes in grammar/spelling, etc. If you find them, please help us by reporting these mistakes here. Note: You can report any trivial errors that you spot. Ex. missing punctuations, inconsistent capitalization, graphic glitches, strange game scripts, etc. If you use emulators to play this game, some emulators have their own limits. For example DesMuMe will have distorted audio if your computer is not fast enough and some versions of No$GBA will crash when you open a mail. These are the problems with your emulators, not the game and we can't do anything with these problems. Please check the homepage for updates.